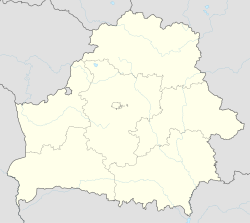 Uzda (Belarusian: Узда; Russian: Узда) is a city in the Minsk Region of Belarus. It is the administrative seat of the Uzda Raion. As of 2009, its population was 10,000. The town's name means "bridle." Uzda was first referred to in 1450 as a country estate belonging to the Korsaks. From the second part of the sixteenth century, it belonged to the Kavechinskys, Zavishas, and Krasinskys. In 1574, Symon Budny spent time there working on a Bible publication. In 1793, it became a part of the Russian Empire. In 1798, the owner of the town, Kasimir Zaviha, built a wooden Catholic church named the Exaltation of the Holy Cross (preserved to the present day). At the time there was also a functioning Orthodox church named Saint Peter and Paul. In 1839–1849, the town had a printer, a school, four primary schools, a brewery, a mill, a pharmacy, a post office, 30 shops and a Sunday Fair. In 1886, it had a public college, a local board of administration, a school, a distillery, a brewery, a cloth factory, two mills, 24 shops, Orthodox and Catholic churches, a synagogue, a mosque, and three prayer houses. From 1894 to 1939, the population increased from 2,800 to 3,500 people. The Jewish population in Uzda in 1900 was assessed as 2,068 people. On July 1, 1924, it was made the center of the Uzda district of the Minsk region. On June 28, 1941, it was occupied by Nazi Germany. About 5,600 people, including 1740 Jews in the ghetto, were murdered. On June 29, 1944, it was liberated by the 300th Voroshilov Partisan Brigade. On December 25, 1962, it was made a part of Dzerzhinsk district. On July 30, 1966, it became an independent district. Between 1970 and 1989, the population increased from 4,300 people to 9,500. Uzda is located 72 km south-west of Minsk, 31 km from the town of Stoŭbcy, and 24 km from the town of Dzyarzhynsk. Both of these towns are crossed by the M1 highway (part of European route E30). ^ "JewishGen Locality Page - Uzda, Belarus". data.jewishgen.org. Retrieved 4 February 2016. Wikimedia Commons has media related to Uzda. This Belarus location article is a stub. You can help Wikipedia by expanding it.